Executed on a piece of grey linen previously dyed in khaki so as to recall military uniforms on either side of the Channel, this painting is based on a superposition of several portraits of the war poet Wilfred Owen. 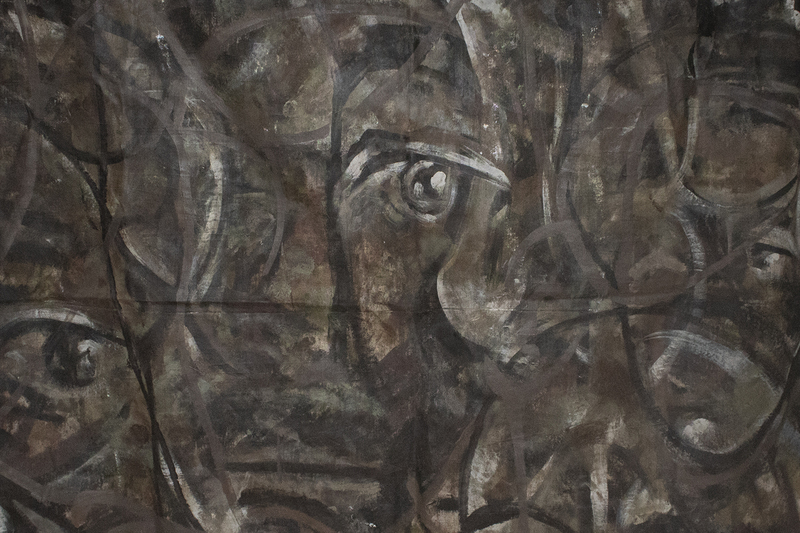 The overall composition is designed to create the effect of a camouflage. Red stains in ink are mixed with dirt brownish tones and dark green, all part of a Great War soldier's drudge when marching and falling on the ground. At first the viewer cannot discern the portraits, but their interconnected shapes form a pattern from which memorial strata emerge. They coexist, dissolve and resonate to remind us that the poet is both absent yet spectacularly present. Cite:Portraits of Wilfred Owen by Félicia Laude at via http://writersinspire.org/content/portraits-wilfred-owen. Accessed on Tuesday, April 23, 2019. If reusing this resource please attribute as follows: Portraits of Wilfred Owen () by Félicia Laude, licensed as Creative Commons BY-NC-SA (2.0 UK).